Here is the deal I want to make sure you do the work. I know life gets in the way sometimes even with the best intentions. Today I am going to be holding you accountable so get ready :-). 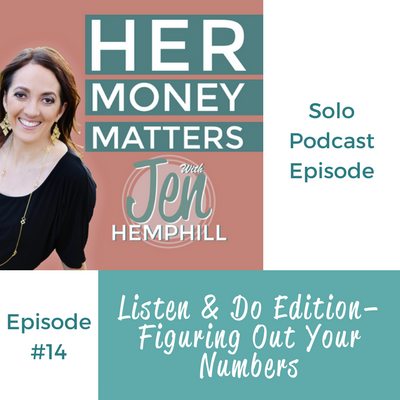 This episode is all about taking action and figuring out what your finances look like in real dollar numbers! This is why it is important to be sure to “listen & do” during the episode. You will find that it complements HMM 12: Three Tweaks To Start Affording What You Want, so if you have not listened to this episode yet, do so before tackling this one. In addition if you haven’t grabbed your Jumpstart Your Money Mini-Guide go ahead and do so below. You will need this to work alongside of me in this episode! So tell me how did it go? Did you finish going through the mini-guide with me? If not why not? What stopped you? Hi Jen, you mentioned putting the numbers into monthly amounts to see your budget/health. What do you recommend for things that fall mid month like credit card statements or other bills. I always get stuck, and then give up, because things aren’t clean with their dates. Thanks for your help! Also do you have any work from home job sites that you recommend? Hi Katelyn! Good to see you back! I hope I’m understanding your question correctly. Don’t let the date of the bill distract you. Let’s say it’s October 1st, you take the total monthly income for that month and plan for that month. Depending on your paycheck schedule–you can let’s say use the 1st-15th bills with that 1st 1/2 of the month’s income and the 15th-end of month the last 1/2 month’s income. There are other ways to do this, but not sure of your specific situation so it makes it hard to answer :-). Does this make sense? As far as work from home jobs sites I am working on compiling that. There are several I have heard about that involve taking surveys etc, but I am “checking” them out as well. There are also companies where you can do “customer service” from your home. So there are options out there I just want to do some research before I mention them.